Discussion in 'Guitars in General' started by RockDebris, May 8, 2016. A few years back I was shopping for an amp to pair with my McCarty. The store didn't have a McCarty to test with, so I tried a 408. It was a versatile pickup system and I knew right away I wanted one. New prices are a little out of my reach, so I watched and waited for nearly 3 years for a used one to come in at price I could (barely) afford. My only requirement of the guitar was that it had the wrap around bridge. I would prefer dot inlays, but that's not an option. I don't really care about 10 tops or any of that. I was telling my wife just the day before I saw this that I had pretty much given up on a 408 and that I was going to turn my attention to getting something more readily available on the used market in my range, like a Mira S2 or perhaps a NF3. Almost as if the universe was waiting for me to say I had given up, BAM. There it was. Almost in my range ($1995). 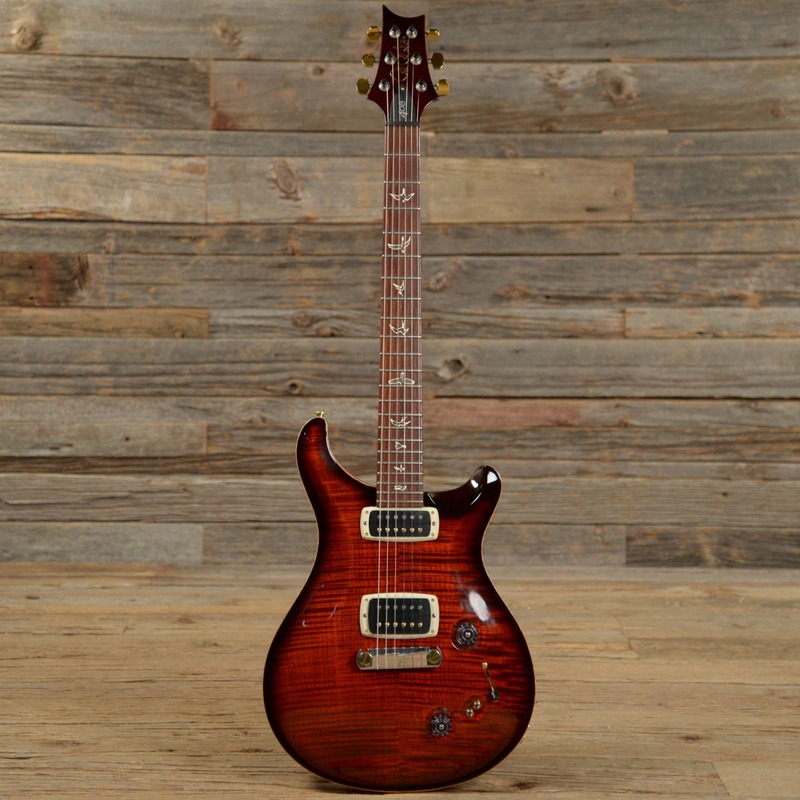 Just a little bit of haggling and I got it for $1700 shipped (still, the most I have ever paid for a guitar ... I bought an SAS new for $1400 11 years ago). Got it on Friday, did my setup on it, and man .... NO REGRETS! They listed the guitar as excellent, but it was in as good a condition as I've ever seen any used guitar, complete with all the case candy. Anyway. Bottom line: thrilled. Worth every penny of $1700. If I could get second one for say, $1500 (long shot price these days), I think I'd have to take it. Soothsayer, Rockin J, jrw32 and 11 others like this. That's a real beauty. Great looking and sounding. Nice to see your vid for the Chapper's challenge. Sounds really nice! Loads of clarity. Congrats! Congrats! I still love my 408 like the first day I bought it. Thanks! Yourself or anyone else here do a vid for that? Awesome score. You got this from Chicago music exchange, right? I saw it online last Week and thought "gee, what a deal, if that's around in June when I go to chi town, I'll have to give it a try." It was gone next time I looked. I wasn't surprised to see it get snatched up quickly at that price. Enjoy, and if you ever change your mind about the axe, PM me - I might be interested. Man, black gold is probably more first choice if I was buying a new one and going for transparent colors. There was was this other one up at Wildwood Guitars for a very long time, it was finally sold. It was a darker red transparent top, no burst, body binding and a natural back. I kept going back to see if it was still there for about a year, but I probably would have never spent the $2800 asking price. I would have been very happy with that! I tend to play it safe in color selection, so a solid back with body binding and the creme and nickel parts would have been perfect. When you are shopping for one of these used, and you have a lower budget, it is hard to be too picky. I really lucked out. Well you can show her this post as affirmation that you got a hell of a deal!! Enjoy in good health. They had a really nice 513 that moved quickly as well. 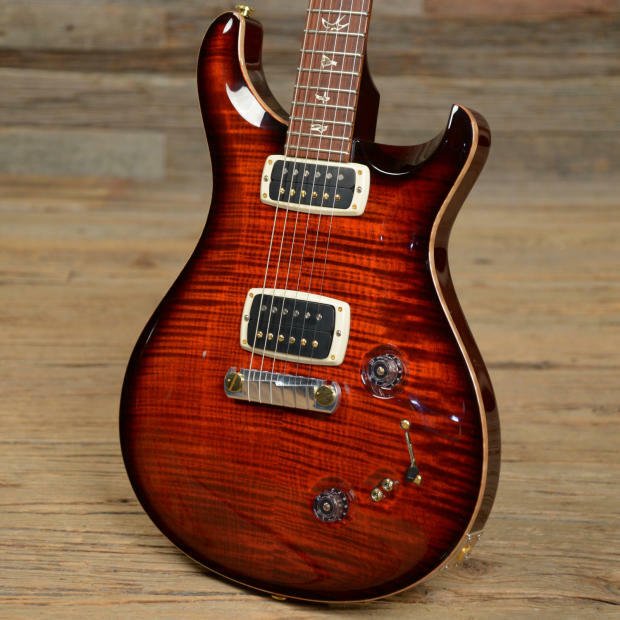 PRS are great guitars. Can't wait to add one to my stable eventually. There's a black gold 408 at my GC, and though I haven't seen yours in person, I think the red is better looking. I'd say you got a hell of a deal, approx 50% of the discounted price it sold for. You're a strat guy, so the knifeswitch is probably right up your alley. Dude, killer deal and killer axe! Love it! Excellent color. I always wanted one of these.